Visit of B.W.I. Trade Commissioner in Canada. Retf. No. '. P. 77/7-- 1. Under the provisions of Articles 25 and 26 of the Austrian State Treaty, British and Allied Nationals may assert claims for the return of their property and the restoration of their rights and interests in Austria. 2. Such persons should communicate with the Administrator's Office, Antigua, not later than the 15th July, 19)56. It is notified for general information that the three year scholarship at the Imperial College of Tropical Agricltunre in Trinidad, commencing in 1956, has been awarded to Mr. K. A. E. Archibald, of St. Kitts-NevisAnguilla. 1. In view of the reported oc(urrence in Florida of the serious pest, the ,1editerranean Fruit Fly, the Governor in (Coucil C as by the Plant Protection (Anmeidment) Regulations. 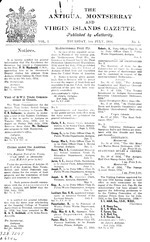 19)6, dated d Jiiuly, 1906, prohibited the importation into the Cololy of Antigna of fresh fruit and vegetables from the United Sta:tes of America. Appointments ;:d traolfers etc., in the public service, with tect trom the dates stated, are published for general informat ion:Clarke, F. A., Junior ( I trk, Adninistration, to be Senior Clerk, Administration, Antigna. Sept. 1, 1955. CONFIRMATION OF ORDINANCES No. 2. No. 16 of 1955, "'The Antigua Constitution and Elections (Amendment) Ordimmee, 1955." No. 9 of 1956. The Trustee Investment in Antigua Government Securities (Amendment) Ordinance, 1956." No, 2 of 1956, St. Christopher Nevis and Anguilla Constitution and Elections (Amendment) Ordinamce, 1956." No. 12 of 1955. "The Road Ordinance, 1955." The following Ordinance and Statutory Rules and Orders are circulated with this Gazette and form part thereof:ORDINANCEI. No. 14 of 1956, "The Old Metal and Marine Stores Ordinance, 1956." 7 pp. Price 10 cts. STATU I'ORY RULES & ORDERS. No. 28 of 1956, "The Antigua Half Cent Stamp Order, 1956." 1 pp. Price 3 cts. No. 20 of 1956, "The Stamps ( cent) Order, 1956." 1 pp. Price 3 s.
H. L. N. White, Esq. 2 THE ANTIA, MON()TSERRAT AND YflGIN ISLANDS GAZETTE. [July 5, 1956.
in class 8 that is to say, talking machine records; sound and picture recording and reproducing records, magnetic tapes, wires and other devices or means for recording and reproducing son nd and pictures. The Applicants claim that they have used the said Trade Mark in respect of the said goods since January 1, 1956. Any person may within three have months from the date of the first appearance of this Advertisement in the Antigua, Monserrat and Virgin Islands Gazette, give notice in duplicate at the Trade Marks Office, Antigua, of opposition to registration of the said Trade Mark. Acting Registrar of Trade Marks. in class 42 that is to say, ice cream mix; milk, and milk and dairy products. The Applicants claim that they have used the said Trade Mark in respect of the said goods for 5 years before the date of their said .X pplication. Any person may within three months from the date of the first appearance of this Advertisement in the Antigua, Montserrat and Virgin Islands Gazette, give notice in duplicate at the Trade Marks Office, Antigua, of opposition to registration of the said Trade Mark. ASAIII KASEI KO(YO KABUSHIKI KAISIIA of 1, Soze-cho, Kitaku, Osaka, Japan have applied for Registration of one Trade Mark consisting of the following:in class 50, that is to say:- artificial silk yarns, threads and fabrics. The Applicants claim that they have not used the said Trade Mark in respect of the said goods before the date of their said Application. Any person mnay within three months from the date of th, first appearance of this Advertisement in the Antigua, Montserrat a 'id Virgin Islands Gazette, give notice in duplicate at the Trade Marks Office, Antigna, of opposition to registration of the said Trade Mark. GROCERIES. Lake & Co. Ltd.
Rice $23.20 per bag of 177 Ibs. Salt Fish .30 per lb. SAlted Beef .A5 per lb. Cheese .80 per lb. sugar 26.29 per bag of 249 lbs. Brown sugar 19.59 per bag of 249 lbs. Flour 9.50 per bag of ()100 lbs. Pork-Snouts 80.00 per brl. of 200 lbs. ; 44 cents per lb. Scalps 59.50 per brl. of 200 lbs. 7.0(0 per 100 lbs. .07 per lb. 8.00 per 50 1b. .16 per lb. Joseph Dew & Sons. Ltd.
42 ets. per Imp. gallon. The Saint Christopher Circuit on Friday the 6th July, 1956 at 1(} o'clock in the forenoon. Dated the 6th day of June, 1956. Juy 57. inJ] THEil ANTIGUA, MONTSERRAT AND VIl(GIN ISLANDS GAZETTE. NO'lICl is here y given that on the 11th day of May, 195t;, a resolution adopting draft schemes in relation to Ohe areas set out in the maps herein referred to was passed by the Cen-. tral Authority. Any representations or objections thereto should )e sent in writing to the Secretary and Executive Officer, Central Authority, High Street, St. John's, within thirty d(lays from the date of this notice. Lands at All Saints formerly part of Sanderson's Estate, comprising of 38.03 acres, bounded as follows, that is to say, on the North by Public road, on the East by lands of the Antigua Syndicate Estates Ltd., on the South by Church lands, private lands and on the West by private lands and public road. Lands at Bendals formerly part of Belvidere's Estate, composing of 13.240 acres bounded as follows, that is say, on the North by public road, on the East lby public road, on the South by lands of Belvidero and on the West by public road. Lands at Bolans formerly part of Jolly Hill comprising of (A) 14.4,10 acres bounded as follows, that is to say, on the North and ELast hy public road on the South by Linds of Jolly Hill and on the West by a stream. (B) Comprising of 2.0S0 acres bounded as follows, that is to say, on the Nortlh by Jolly Hill on the East and South by public road and on the West by a stream. Lands at Five Islands formerly part of Sutherland's Estate cormprising of (A) .076 acre bounded as follows, that is to say, on the North and East by public road, (on thile South 1v old village, on the West by Cr ow lands. (B) Comprising of 3.751 acres bounded as follows, that is to say, on the North by Crown lands on the East and South by public road and on the West by Church lands. follows that is to say, on the North by Freemnian's Estate on the East and South by public road on the West by Freemanville. Lanis at Pares Village formerly part of Codrinton's Estate, comprising of S&356 acres, bounded as follows, that is to say, on the North by public road, on the East und South l y lands of the Antigitua Syndicate Estates Ltd., and on the VWest by lands of the Vntigua indicate Estates Itd. and existing village. Lands at Parhami formerly part of Crown lands comprising of 10.24 acres bounded as follows, that is to say, on the North by public road, on the East by Church lands and private lands on the South and West by Crown land. Lands at St. Philip's formerly part of Lower Waldron comprising of 23.7.5 acres bounded as follows, that is to say, on the North by lands of Lower Waldron on the East by lands of Lower Waldron and public road on the South by lands ofh ilobee and Lyon's 'stare and on the W\est by Lyon's Estate. Lands at Table I[iil G(ordon formerly part of Table Hill Gordon's Estate comprising of 8.529 acres bounded as follows, that is to say, on the North and East by public road on the South by lands of TI able Hill (Gordon and on the West by lands of J. M. ]d wards. Lands at Willikies formerly part of Comfort Hall's Estate comprising of 15.59(; acres bounded as follows, that is to say, on the North by private lands on the East by Crown lands on the South and West by lands of Comfort Hall Estate. S creltary & laecutive O ficer Central Authority. Dated the 12th day of March, 1956. Secretary & E''ecutire Oficer, Central A uhority. It is hereby notified for general information that an examination for a ntnuner of Government Scholarships to the Antigua Grammar School and the Antigua Girls' High School will be held at the St. John's Boys' Schoolroom on Wednesday 5th Septemner. 1956. Colony for a period of three years immediately preceding the 31st December, 1956, the last twelve months being at a school in Antigua. Applications must be made to the Inspector of Schools not later than Wednesday 15th August, 1956. Application must he accompanied by a birth or baptismal certificate, certificate from Head Teachers of Schools certifying regular attendance for the three previous years and good behlaviour of the candidate and evidence of the need for financial assistance to parents or guardians to pay for secondary education. Application forms can be obtained from the Inspector of Schools. (a) Arithmetic, including numeration and notation, length, time, weight (English Units) Money (English and American Units), a iA the application of the four rulhs to them with simple, vulgar and decimal fractions. story read to or by them. Each successful candidate is required to present a medical certificate of good health to the Head Master of the Antigua Grammar School (in the case of boys) and to the Headmniistress of the Antigua Girls' High School (in the ease of girls).